Dr. Yu Jingmao is a Chief Physician of Chinese Medicine, Professor of Zhejiang Chinese Medical University, vice-chairman of Pediatrics Profession Committee of World Federation of Chinese Medicine Societies, pediatrics profession committee counselor of China Association of Chinese Medicine, and the foregoer of "Yu Jingmao's Academic Inheritance Studio of National TCM Experts". Dr. Yu has been devoted himself in pediatrics common diseases and miscellaneous diseases for over 50 years, abundant experience has been accumulated in treating RRTI (Children's Recurrent Respiratory Tract Infection), asthma, capillary bronchitis, chronic cough, dyspepsia, enuresis, transient tic disorder, hydrocele of tunica vaginalis and other diseases. He had been directing and participating 6 national, ministries and provincial research projects. His research achievements had successively awarded Second Prize of Science & Technology Development of Zhejiang Province, Second Prize of Science & Technology Development of China Ministry; and Third Prize of Science & Technology Development of China Ministry. Over 50 papers have been published in distinguished domestic and overseas academic journals; 20 professional monographs have been published and distributed. Dr. Sheng Lixian is a Chief Physician of Chinese Medicine, professor, excellent instructor of academic experience inheritance task of national experts of Chinese medicine. She has over 40 years pediatrics clinical experience, specialized in treating infantile asthma, chronic cough, and nephritic syndrome based on syndrome differentiation. Dr. Sheng is in charging and participating over 10 subjects, won 6 awards and published over 40 academic papers and 7 books. Dr. Chen Jian is a Chief Physician Medicine, Doctor of Medicine. 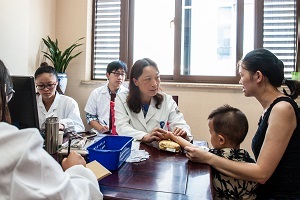 She is academic experience successor of Dr. Xuan Guiqi's-National Notable TCM Expert, committee member of Pediatrics Board of China Association of Chinese Medicine, standing committee member of Pediatrics Board of Zhejiang Academy of Chinese Medicine. 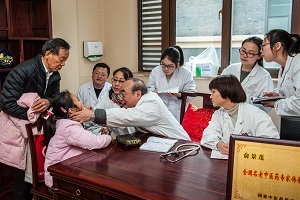 Dr. Chen started to work in pediatrics department since 1989, specialized in treating valetudinarianism due to children immune disorder, like recurrent respiratory tract infection, chronic cough, and refractory asthma. And also she is good at nervous system disease, like transient tic disorder; ADHD; hyperpyretic convulsion; etc. She also uses TCM to protect from infantile anorexia and dietary bias. Dr. Chen Hua is a Chief Physician of Chinese Medicine, supervisor of postgraduate, the forth batch academic experience successor from senior Chinese medical experts, one of the First Hundred National Outstanding Female TCM Physicians, committee member of Pediatric Profession Board of China Association of Chinese Medicine, committee member of Chinese Association of Integrated Chinese and Western Medicine, vice chairman of Pediatric Profession Board of Zhejiang Association of Chinese Medicine, committee member of Medical Ethics Board of Zhejiang Medical Association. 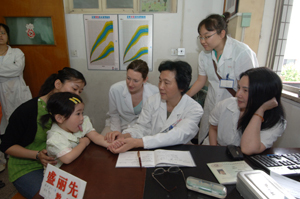 Since 1986, Dr. Chen had become a professional pediatrics doctor, meanwhile devoted to scientific research and educational programs, specialized in treating pediatric spleen-stomach diseases and pulmonary disease with integrated Chinese and Western Medicine, gained rich clinic experience in infantile diarrhea, chronic gastritis, recurrent respiratory tract infection, asthma etc. Dr. Chen has been directing and participating over 10 scientific researches, 5 achievements have awarded by Science and Technology Development of Zhejiang Province. She also published over 30 academic papers and 6 monographs and textbooks.